Google’s popular browser, Google Chrome is actually among the top browsers. The best part is that this browser is now available for use on your iPad and iPhone as well. All this is due to the fact that Apple Inc has granted the access of the browser on its much preferred devices. Launched in the year 2008, Google Chrome overtook Internet Explorer by Microsoft and became the most popular browser in the world. Since then, it has been enjoying the top position and nice status among users. Google’s popular browser along with the amazing Google Drive, cloud storage facility has started appearing in the App Store for easy download by the users. 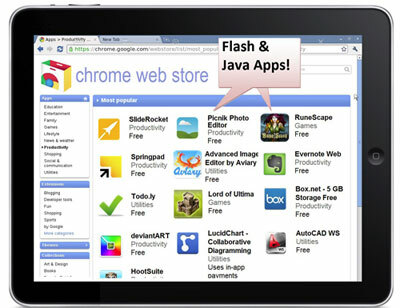 The browser was available in the store since Thursday, 28th June 2012. In fact, Chrome for iOS seems to be great and functions just like Android and desktop versions. The great part is that the browser is available for the devices that run iOS 4.3 or even higher. The web browser is easily available from App Store now. So, what are you waiting for? Make your iPad and iPhone usage experience all the more enjoyable and simpler with Chrome on it. Chrome app actually is the iOS and iPad version of the speedy Internet browser of Google. It helps you to easily sync the personalized Google Chrome experience right from the desktop. It is featured with the omnibox that lets you search as well as enter the sites, easily allowing you to sync the tabs, passwords, omnibox data and bookmarks from desktop to iPhone and iPad. With the app, you can search faster and navigate quickly right from same box. You can further sign into Google Chrome in order to sync the open tabs, passwords and others from your desktop to iPad or iPhone. You can also send pages from the browser on your desktop PC to the iPad or iPhone with just a single click. Later, you can read the pages even when you are in the offline mode. In all, you can even download the browser using direct App Store links. It is important to remember that it might take some time for Chrome to be available in the App Store in all countries. So, check out if it is available in your country or not and start using it on your iPad and iPhone.